Old-Timers' Day (or Old-Timers' Game) generally refers to a tradition in Major League Baseball of a team, especially the New York Yankees, devoting the early afternoon preceding a weekend late afternoon game to celebrate the baseball-related accomplishments of its former players who have since retired. The pattern has been copied intermittently by other sports but has failed to catch on. The New York Yankees held famous ballpark celebrations to recognize the careers of two of their all-time greats, first for Lou Gehrig on July 4, 1939 (several weeks after he was forced to retire young because of ALS), and Babe Ruth in April 1948. Lou Gehrig Appreciation Day was held on July 4, 1939, and remains baseball's most famous such gathering. After hearing tearful speeches from friends and former teammates who had seen his career cut short by the illness which would come to bear his name, Gehrig delivered a short poignent speech, immortalized by his declaration that in spite of his fate he still considered himself the luckiest man on the face of the earth. The first Old-Timers' Day held as an Old-Timers' day took place on the final day of the 1947 season. Today, the team invites several dozen former ballplayers, including many Yankee greats and fan favorites, to be introduced to the crowd. Former coaches and managers, trainers, and broadcasters also participate in the festivities. Hall of Famers and special honorees cap the celebration, with those of the highest standing introduced last. Then participating old-timers are split into two teams, often called the Clippers (after the legendary Joe DiMaggio, the "Yankee Clipper") and the Bombers (homage to the team's legacy as the "Bronx Bombers"), to face one-another in a short exhibition contest. During the years he attended, DiMaggio would always be introduced last as "baseball's greatest living player". In 1978, when Billy Martin was introduced after him as part of a stunt announcing he would return as manager in 1980, DiMaggio complained and said if anyone was introduced after him without his permission he would no longer return; it never happened again. He made his final appearance in 1998, missing only the 1988 game due to a scheduling conflict. Since his final appearance, Whitey Ford and Yogi Berra have traditionally been the last players introduced. Berra made his final appearance in 2014. Other elements of the day's ceremonies include a moment of silence for members of the Yankee family who died in the previous year, and introduction of the widows of great Yankees, a tradition that started with Claire Ruth and Eleanor Gehrig attending into the 1970s and 1980s and continues today with Diana Munson, Helen Hunter, Jill Martin, Arlene Howard, Kay Murcer, and Maggie Coleman, all escorted by current Yankees players. Ruth's daughter and granddaughter have also been introduced in recent years. Members of the Mantle and Maris families have also been introduced in the past. Mel Allen was the original master of ceremonies, followed by Frank Messer, and then John Sterling and Michael Kay handling the duties as a team. People like Keith Olbermann and Bob Wolff have also contributed. A modern addition, started in the past 20 years, involves a few "Old Timers", typically current Yankee broadcasters, being wired for sound to provide running commentary during the game, starting with Bobby Murcer and continuing with Paul O'Neill, David Cone and John Flaherty. Since this is the only game played for most, if not all players, all year, the games are generally low-scoring affairs and are usually only three innings or so in length. However, there have been some famous occurrences. In 1973 to celebrate the final Old Timers' Day in the original Yankee Stadium, Whitey Ford pitched to Mickey Mantle allowing Mantle to hit a home run, the final of his lifetime. In 1975 the Yankees held Old Timers' Day at Shea Stadium and prior to the game it was announced that Billy Martin had been hired as Yankees' manager for the first time. In 1985, Phil Rizzuto was hit in the nose with a ground ball, leaving him a bloody mess. After that, "The Scooter" stopped playing in Old Timers' Games and became one of two, along with Joe DiMaggio to wear a suit and not put on the uniform. More recently, in 2014 Whitey Ford and Yogi Berra wore suits instead of uniforms and rode onto the field in a golf cart because of their health. In 1991, Reggie Jackson made his first appearance at Yankee Stadium since retiring as a player. In the game, he got a hit, and made a shoestring catch in right field, belying his image as a great hitter but a poor fielder. In 1998, the Yankees celebrated the 20th anniversary of the 1977, 1978 and 1981 World Series that they played against the Los Angeles Dodgers, and invited some members of those Dodger teams. The game was won on a home run by Willie Randolph against Tommy John, who played in all three of those World Series, for the Dodgers in 1977 and 1978 and for the Yankees in 1981, on the losing side each time. In 2003, Luis Sojo hit the game-winning home run off of Ron Guidry. In 2010, the Yankees celebrated the 60th anniversary of the 1950 World Series championship team. They invited Hank Workman, Whitey Ford, Jerry Coleman, Don Johnson, Duane Pillette, and Charlie Silvera to represent the team. However, Yogi Berra missed the day due to a fall. In 2011, Tino Martinez hit a two-run home run off of former teammate David Cone. In 2016, Hideki Matsui hit a home run off David Cone into the upper deck. It is possibly the longest home run in Old Timer's Day history. Some players who have been considered 'staples' at Old Timers' Day include Hall of Famers Yogi Berra and Whitey Ford; Dr. Bobby Brown; and Reggie Jackson. Joe DiMaggio returned in 1952 for his first time, and returned every year until his death with the exception of 1988, a span of 46 years, the second-longest tenure of any Yankee Old Timer, (Hector Lopez surpassed him when he attended his 47th in 2013). Don Larsen, David Wells, and David Cone have all attended in recent years, allowing the Yankees to have all three of their pitchers who have thrown a perfect game in the stadium at the same time. Hector Lopez has appeared at every Old Timers' Day since 1966, a span of 50 years as of 2016. From 1982 to 1985, an Old-Timers' Classic sponsored by Cracker Jack was played at RFK Stadium in Washington, D.C, each July. The inaugural Cracker Jack game, played on the evening of July 19, 1982, was particularly memorable; then-75-year-old Luke Appling connected off Warren Spahn for a 250-foot home run to left field. An Old Timer's Game was played at Comiskey Park in Chicago during the All-Star Game festivities in 1983 to celebrate the 50th anniversary of the first All-Star game, coincidentally at Comiskey Park. ↑ "www.HistoryOfTheYankees.com". Retrieved June 12, 2016. ↑ "On This Day: Lou Gehrig Delivers "Luckiest Man" Speech". Findingdulcinea.com. Retrieved November 25, 2011. ↑ Altman, Billy (August 3, 2008). "Yankee Greats, and Not-So-Greats, Celebrate the End of Many Eras". The New York Times. Retrieved November 25, 2011. 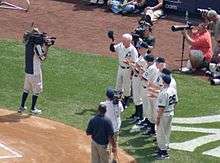 ↑ "Yogi Berra and Whitey Ford Highlight the New York Yankees 65th-Annual Old Timers Day June 26th". Cardboardconnection.com. June 27, 2011. Retrieved November 25, 2011. ↑ "DiMag/post playing story by Marty Appel". Retrieved June 12, 2016. ↑ "Guidry Supports Schilling Move". Retrieved June 12, 2016. ↑ "Yankees legend Hector Lopez is baseball magic for this big kid". Retrieved June 12, 2016. ↑ Kaplan, Jim (August 23, 1982). "Luke Appling, the Braves' 75-year-old minor league batting - 08.23.82 - SI Vault". CNN.com. Sports Illustrated. Retrieved November 25, 2011.